The two suspects behind the Charlie Hebdo massacre in Paris have been on a US No Fly List ‘for years,’ a US official said. According to different revelations, one of the suspects trained with Al-Qaeda-linked militants in Yemen. Cherif Kouachi, 32, and his older brother Said Kouachi, 34, French-born sons of Algerian parents, were both logged in the US government’s Terrorist Identities Datamart Environment (TIDE) system, a database on known or suspected international terrorists, US counterterrorism sources said on condition of anonymity. TIDE contains over one million names. The sources added that the brothers were considered to be dangerous enough for their names to be sent to the FBI’s Terrorist Screening Center, which put them on a No Fly List, the most restrictive of the lists. Created and maintained by the United States government's Terrorist Screening Center (TSC), it includes names of 47,000 people who are not permitted to board a commercial aircraft for travel in or out of the United States. A person placed on that list is viewed as a “threat to civil aviation or national security.” The brothers had reportedly been listed in the databases for "years." However, a spokesman for the TSC, Dave Joly neither confirmed, nor denied the information. "Disclosure of an individual's inclusion or non-inclusion in the TSDB (screening databases) would significantly impair the government's ability to investigate and counteract terrorism," he told Reuters. France’s counterterrorism officials are familiar with the Kouachi brothers, mostly because of Chérif Kouachi. The younger brother, Chérif, a former pizza deliveryman, was sentenced to 18 months in prison in 2008 for trying to join up with fighters battling in Iraq. He was stopped by French counterespionage officials from taking a Syria-bound flight. At his trial in 2008, Cherif Kouachi’s lawyer said his client had fallen in with the wrong crowd. Also at the hearing, it was revealed that Kouachi underwent combat training, which included jogging in a Paris park and learning how to use a Kalashnikov automatic rifle. In a French TV documentary on Islamic extremism, Cherif said a firebrand Muslim preacher put him on the path to jihad, AP reports. In 2010, Cherif was investigated by police in an alleged plot to free an Islamic militant sentenced to life in prison for bombing a Paris train in 1995. He was released without charges. At the same time, a US official said that Said Kouachi had traveled to Yemen, but it was unclear whether he was there to join up with extremist groups like Al-Qaida. At the same time, according to a Yemeni official familiar with the matter, the government knew of Said Kouachi’s possible links with AQAP. When Said visited Yemen, one of AQAP's top inspirational and organizational leaders, Anwar al Awlaki, was responsible for spreading the group's militant message to European and English-speaking audiences. However, it is not yet clear if Said was in contact with Awlaki, who was killed in a CIA-linked drone attack in September 2011. According to sources, when Said returned to France from Yemen, both brothers seemed to be shying away from any suspicious activities that would have attracted the attention of the Paris counterterrorism services. As sources have told Reuters, the men were not treated as priority targets by French counter-terrorism agencies. Now the Kouachi brothers are suspected of being behind the attack on Charlie Hebdo magazine HQ, which killed a total of 12 people, including the magazine's top editor, prominent cartoonists, and two policemen. 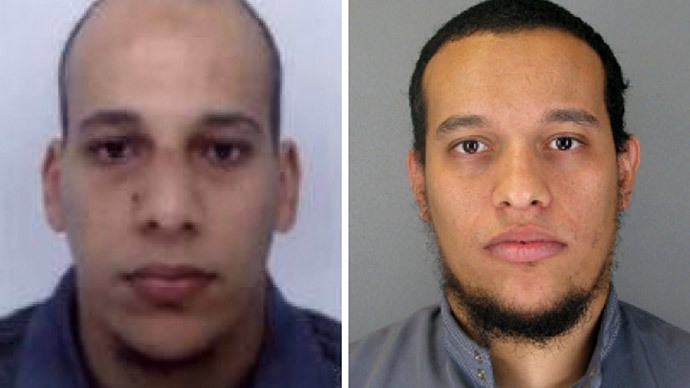 France has launched a large-scale manhunt for the brothers. The third suspect, Hamyd Mourad, earlier handed himself in at a police station in Charleville Mezieres, after seeing his name on the list of suspects on social media. Thousands of people across the world have rallied against the shooting, which is believed to have been carried out in retaliation to the controversial cartoons published by Charlie Hebdo. The weekly often satirizes religion, and particularly the Muslim Prophet Muhammad, in its illustrations.